A few weeks ago I was shown round the archive of old magazines and newspapers in the basement of Time UK's offices. There were old copies of everything from NME to Woman's Own to TV Times and Horse and Hound. I've seen this kind of treasure house before. If you've never worked in the magazine business you probably think all that stuff must be a really valuable resource. If you have worked in magazines you know it isn't, because it's never kept in a form that makes material easy to retrieve and it's difficult to re-publish because nobody knows who has the rights. From time to time publishers have plans but they always back down as soon as there's the threat of a copyright claim. I've seen it happen lots of times. 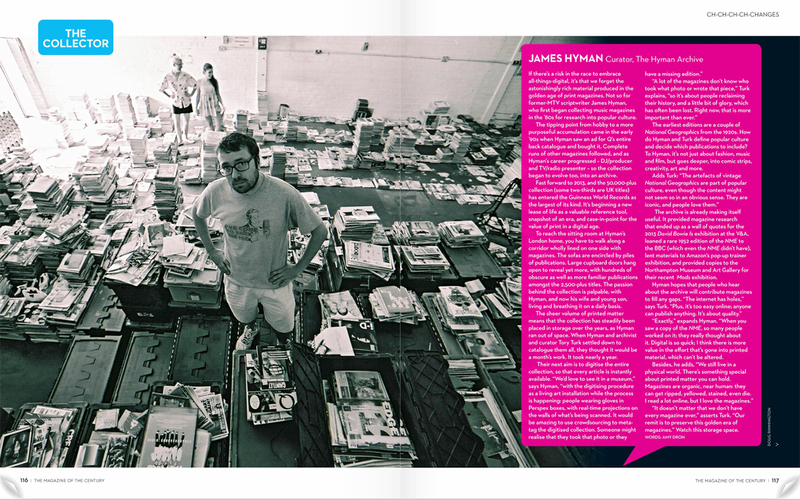 That's why I'm interested in the James Hyman Archive. This is the world's largest private collection of magazines and it just so happens that it's heavy on the music and lifestyle titles I've always had a personal and professional interest in. James (above with collection) has got backers and the support of industry body the PPA who are keen to see this collection digitised and turned into an archive which could be useful to all sorts of people in the advertising and media industries. James explains more about it here. I've written a column about it for In Publishing. I'd like to see it happen, not because I might make a few pounds from it. I really don't care about the money. I care about the work and the people who did it. I share your view on this, David. The BBC Project Genome online digitisation of Radio Times, for example, is not perfect but it's still an invaluable resource. I used it in conjunction with three visits to the BBC Written Records Centre in Caversham (one by myself, two on my behalf by someone who lives rather closer to Caversham than Belfast is) in some very detailed research for chapters on the 1920s-60s BBC careers of Irish musicians Leo Rowsome and Séamus Ennis for a forthcoming book on uilleann pipers. Having that resource saved me days poring over old Radio Times issues in print at the British Library, plus the expense of getting there and staying in London. There are no archives for Radio Times let alone Melody Maker et al in Ireland. I've also used, in the same book, material gleaned from a digitised online copy of a book from the 1700s - the original pages scanned yet somehow searchable despite the olde-worlde lettering. Invaluable. James' archive, if digitised and especially if searchable, will surely be of immense value to historians let alone casual browsers. I'm surprised but delighted that he's got backers. This is the sort of thing where everyone can see it's worthwhile but one would imagine few would put money where that thought is. Digitised searchability, aside from logistical and temporal convenience (as in the Radio Times example above), can also offer something that pure slog through print or microfiche copies of a journal can't: a clear ability to see patterns of coverage. If Melody Maker, NME etc were searchably digitised it would throw up similar fascinating patterns of coverage. One could see, for instance the vast concentration of coverage for Quintessence between 1970 and (the first half of) 1972, followed by a swift fall into the abyss of history thereafter. These patterns of fashionability/out-of-fashion are themselves revealing and sometimes unexpected. It would make music historians' tasks much easier and throw up details and insights that would be otherwise very difficult to spot. Fingers crossed James' project gets a fair wind. On the YT clip I saw a magazine cover being scanned but is there a non destructive way to scan the pages? Otherwise it will be, for some mags, crack back the spine and scan away or live with the unfocussed margin of a flipped back page. At what point does a collection become an obsession become hoarding become an archive? My apologies for the double post above! Paul Adderley - Yes, collection holds US & UK Esquire. Colin Harper - Great insightful post, thank you. You are spot on when talking about digitised searchability improving on print / microfiche copies. Moreover, key is tagging, so for example, imagine searching for an image of "David Bowie smoking a cigarette" in an 80s "Melody Maker, "Silver Dress(es) worn by Kate Moss" in 90s Vogue magazines. Our prototype can do this. Going deeper, a search for a 1950s born, bisexual actor(s) who appeared in a film(s) with Jack Nicholson. Again, we can technically achieve these 'federated' searches. Patterns of coverage are equally exciting: drilling into the results can shed light on the popularity, why certain events happened etc. Imagine tracking the life of an artist or trend through one title / multiple titles via any combination of text / image / adverts. Andy Brim - I want to keep a 'file / master' copy of every magazine that is to be scanned, so if we do destroy any, it will be spares / duplicates. The physical artefact is important to me, running alongside the digital copy. CJ and PK - Good call & I remember the story well to the point where I went on BBC Radio 2 / Jeremy Vine to comment on it (during the archiving of my collection): https://youtu.be/KvzPEIiSH-0"